This past week was definitely one for the memory books! 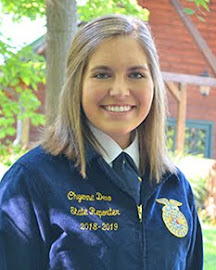 After attending 3 banquets, 3 State Contests, and putting over another 1000 miles on my truck it is hard to grasp that my year as an Indiana FFA State Officer is coming to an end! It seems like just yesterday that our team went swimming for the first time in the lake under the moonlight and recited our "opening ceremonies" part. 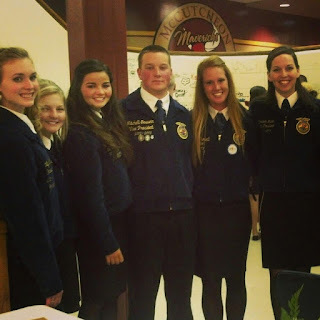 Though this year has flown by, I will never forget the memories made with my teammates, and FFA members across the state! Some of these great memories come from this past week. 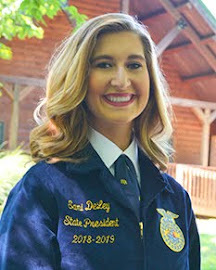 On Monday I had the opportunity to attend and speak at the Heritage FFA Chapter Banquet, a chapter near my hometown, and a chapter that I have grown close to over the past year! At their banquet I had the honor to deliver a keynote address to the members and guests about "Confidence". The next night my teammates and I went out for a fun-filled evening to relax and bond as a team. Our first stop of the evening was SkyZone, an indoor building full of trampolines where we jumped, laughed, and dodged each other....p.s. no one was injured....then we headed over to Applebee's for dinner. 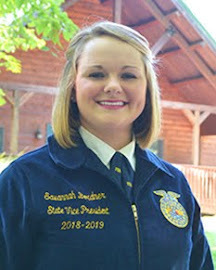 On Wednesday and Friday I found myself behind the wheel of my pick-up truck traveling North to the North Judson San Pierre banquet, and Traveling East to the Randolph Central FFA chapter banquets. 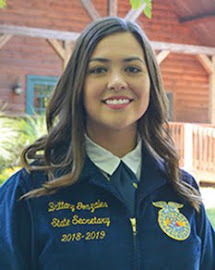 These were two outstanding banquets, that really showed how much their communities support FFA and the agriculture industry. After my banquet at Randolph Central I traveled back across the state to Purdue University where the Indiana FFA State Dairy, Poultry, and Livestock CDE's were held! All day Saturday you could find the state officers running cards, tabulating scores, and passing out awards! Although it was a very long day, I am still amazed by the time, hard work, and dedication the advisers, members, and coaches put into the contests! 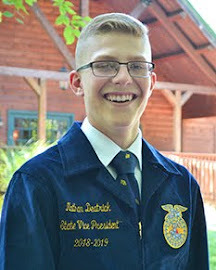 As you can tell we have been very busy this past week, and will continue to be in the weeks to come prior to our 84th Indiana FFA State Convention! "Although you may outgrow the jacket, you will never outgrow the experience!" Tis the Season for Banquets! I have been having a complete blast driving around the state of Indiana attending FFA banquets! All of them have been outstanding. 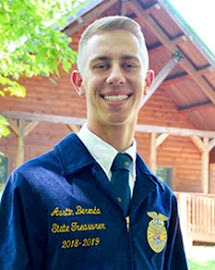 I love seeing FFA members rewarded for their hard work. 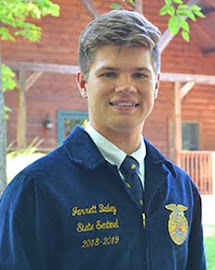 From witnessing members receive their Greenhand Degrees, Chapter Degrees, and Hoosier Degree Chains to seeing FFA members receive special awards like Star Greenhand and Star Chapter Farmer, it never fails to be a special moment. I had the opportunity to go back to my home chapter's banquet where I was reminded that this is where it all starts for every FFA member; it starts at your home chapter. We learn and grow and become exemplary leaders through the help of our advisors, family, and fellow members. 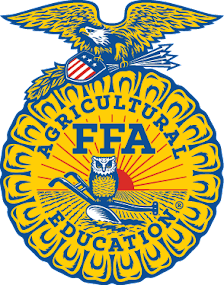 With the school year coming to a close, don't forget to thank your advisors for all that they do for you as an FFA member! The state officer team cannot wait to see you all at convention! Pictured above are members from the McCutcheon FFA Chapter of District IV at their annual awards banquet! Great job McCutcheon!